Yes, to say I have been busy all day is an under statement. Thursday is always 'Hair Day', so always an early start. But, after trying on friend P's leather jacket I wanted one (nay - desired one is not too strong a word). It came yesterday - I adore it but I have to be realistic - it is a tad too small. I was out when the parcel came yesterday, so first of all I had to go down to our Post Office to collect the parcel. After hair there was a bit of shopping to do (friends coming for a meal tomorrow night) and then it was home to try on the jacket - then a call to the supplier and a promise of a replacement a size bigger meant a re pack of the jacket and another trek into town to post it recorded delivery. Home again I did a load of washing, watered the plants, made soup for tomorrow evening, and am just about to sit down and watch the next round of the Best Home Cook with Mary Berry. I think I have the perfect excuse to put my feet up. There is something very relaxing about Poetry - especially when it is read aloud. For me it is not something to read quietly to oneself - it is for reading aloud. Not so many of us at our monthly Poetry today, but it is quality not quantity which matters and we had a lovely afternoon. My morning, which started out quite relaxed and pleasant did rather gather momentum as the morning went on. The bank, the Post Office, the Solicitor, all went swimmingly until I arrived home to find that my gardener had put all the grass cuttings and weeds into my grey (i.e. rubbish) bin - being on the farm we had no need for a green (garden rubbish) bin. So I went on line to order a green bin (22 pounds per annum) - this took me such a long time because my computer seems to have mixed up all the signs. Each time the council form told me to put in my e mail address, instead of putting in @ when I pressed that key it printed "
- later at Poetry I found another person who had had the same problem this mor ning with the same two keys. Just now, trying to print the pound sign for the top of this paragraph, when I pressed the pound sign all I got was #. Can anyone please explain to me exactly what has happened? As it seems to have happened to someone else I am assuming that it is not necessarily my computer. Any ideas? The News on so many subjects - Terrorism, Brexit, the situation in Italy, the Irish referendum on abortion, the fall in the stock market - all seems to be gloom and doom. Perhaps I belong to the 'head in the sand' brigade but at my age I am sorry but I just can't get het up about any of it. Perhaps this is selfish but all the things which are headlines today seem to be forgotten by this time next week. All the issues like the state of things in the Middle East, the plight of people in countries like the Yemen - all this is headlines for a short time and then one would think the problem had gone away because no more is heard of it - nothing could be further from the truth. For this reason, and also to keep my sanity in my old age, I do what I can with donating money to what I consider to be a 'safe' just cause (not as easy to find as one might once have considered) and after that I get on with my life. So, what has today held for me here in my little town in the Yorkshire Dales? It has been a lovely day. Firstly the weather. I got up at seven to quite thick fog and that fog turned to mist and to mizzly rain which has never really gone away - so the temperature has never gone above 15 degrees. But the good news was that it happened to be M's birthday and so six of us celebrated by going out to breakfast (in my case pancakes, streaky bacon and maple syrup). Then three of us (including M) went off to our county town Northallerton (a lovely, rather old-fashioned town of super shops) to have a look round for various things. I can't walk far but I arranged to go and sit in a tea room when my legs were tired and we all three ended up there for coffee and cake. M got a free piece with a burning candle in the top because it was her birthday!! For the past few weeks, since it became warm, I have had a nasty smell in my kitchen. I finally traced it to the waste pipe leaving my dishwasher. When I was walking this morning with Tess I realised that there was a Plumber's van parked outside a house we pass every morning (the van is always there) and shortly after we passed the van a chap got in and the van drove towards me. I flagged the driver down and spoke to the men inside. To cut a long story short they came this afternoon and solved the problem. There had never been a U bend (a trap) on the outlet pipe from my dishwasher - consequently I was getting the smell from the drains backing up into the kitchen!! In half an hour the problem was solved. Don't let anyone ever complain to me about plumbers again - I call that first class service. To add to all this, my gardener has been and cut my lawn and is returning to do more jobs for me tomorrow. It is now 6.36 and I feel that today has been a satisfactory day all round and - when you have read this - I am sure you will agree. Bank Holidays are days to be got through when one lives alone I feel. Families go out together on picnics or to visit National Trust Houses and the like. Us loners have a day like any other and are quite pleased when the day is over. In addition it has been very hot here so that it has been a real effort to do anything other than sit about. I planted one of the three plants I bought - a thistle with deep red flowers - watered the pots that needed a drink, cooked a light lunch and then I am ashamed to say I slept for a couple of hours on the settee. That doesn't mean I shall not be tired at bedtime. I am tired already. Tess and I have just walked to the field and back. In the field we had a brief word with Mr Aberdeen Angus and his group of Fresian 'misses'. There was a lot of flirting going on amongst the ladies but Mr Bull just lay there, chewing his cud and gazing into space. I am sure he will do his job when the time is right. and yesterday my friends took me out for lunch before they set off for home. Today is our four friends lunch - the usual Sunday fare, so you will see that there has been minimal effort on my part. The friends are the friends who W and I often meet in Kirby Lonsdale and friend P has been a friend since he was in his early twenties and he is now getting near to seventy - and has always seemed like my second son - so no hassle really. After they had gone I stripped the beds, washed the sheets , dried them on the clothes line, brought them in and ironed them - now they are aired and sometime today I can make up the beds again. Mare's Tail is growing well. I have decided it is best to ignore it, try to lighten the soil where it is growing worst, plant up as close as possible with plants which grow higher than it does and enjoy my garden. To that end I bought three plants, all of which are quite tall - a thistle, a euphorbia and one other which I can#t remember the name of (and as I am sitting here in my nightie typing this I shall not go outside to look). It is alright for Cro lolling about there in France and for those of you who live in the South of England where the weather is balmy - but I can assure you that here in North Yorkshire the sun may be out but the wind is mighty chilly. I am enjoying the gardening bug and now never travel without my plastic bag in case I see a handy shrub (I like trying cuttings!). Have a nice week-end. Visitors staying. Back on Saturday. lovely photograph when they were out this afternoon. 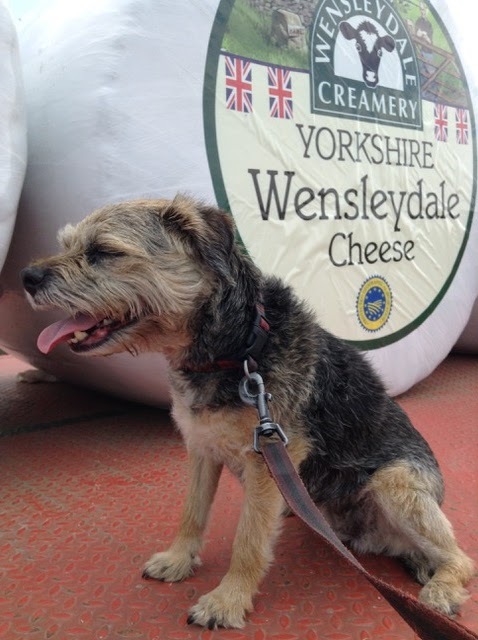 The 'cheeses' were put in the fields for when the Tour de Yorkshire went through a couple of weeks ago. Thank you S - delightful photograph. Only one word to describe today's weather here in North Yorkshire, East of the Pennines - cold. There is a haar coming in off the North Sea (Poor Thelma must be suffering more than we are here - North Stoke on my sidebar). It is set to get better this afternoon although I doubt it will at the moment as there is a sharp cold wind blowing and the sky is cloudy. As children we used to argue about whether 'Ne'er cast a clout 'til May be out' referred to the end of the month or the arrival of the May blossom. Well I have seen some May blossom out today at the end of my neighbours garden but there is still a week to go to the end of the month, so I shall hedge my bets and keep my thermal vest on (sorry if that is too much information - although small fry by today's standards). I was up with the lark this morning and into town before nine o'clock to do my last minute shopping for friends coming to stay tomorrow morning. Back home by ten I had run out of steam so sat down for an hour with The Times and a Bounty Bar I had bought myself. Nothing like being a bit self-indulgent is there? I took Tess for her morning walk very early and friend S usually takes her this afternoon and has said she will be here just before two, and how Tess enjoys that. She jumps for joy when she sees S arrive. My cleaning lady is also coming this afternoon so I shall be pretty superfluous. There is nothing like the prospect of visitors to make one look in the corners for the gathering of dust, check on the store cupboard to make sure essentials are to hand, wash the dusters - this last one was prompted by my cleaning lady who suggested she wash them the other week! The fact is that when one lives alone it is easy to let all these things slip as there is usually only yourself likely to see. (well the dog too of course but I don't suppose she cares for an instant as long as Pedigree chum in Jelly and Bakers complete arrive in her bowl at 4pm exactly (and yes, I am certain she can tell the time). Morning coffee with the girls and a nice long chat over a cafatiere of Italian each. Then it was home home for lunch and today - in a fit of enthusiasm - I put on the oven and cooked myself scampi and a collection of veg (petit pois, carrot batons, baby sweet corn and broccoli). Now I am about to boil myself a couple of eggs for my tea. The amount of work I have done today - plus a nice long walk down the farm lane with Tess - means I have earned it - and in any case I am hungry. So I shall away to boil the eggs and have them ready to put on a tray so that I can watch 'Antiques Road Trip' in comfort. Have a nice evening. One of the things about living alone is that, certainly as far as I am concerned, it is difficult to bother with cooking for oneself. Jacket potatoes are my staple lunch food when I am not eating out. They cook in my Remoska so don't use much electricity and come out crisp-skinned, not soft as they do from the microwave. I split them in half, add a knob of butter and then some kind of filling - often cheese, or any kind of tinned bean, or tuna and sweetcorn mixed - there are plenty of choices. I am not much of a meat eater so never think of cooking meat for myself. Fish sometimes - maybe a piece of salmon with veg or a sea bass with veg (both pan-fried). Tea usually consists of something like a sandwich, a salad with cheese or hard-boiled egg. Breakfast is always weetabix and a banana - never varies really. So it is good that I have visitors coming for a few days later this week and shall have to make an effort to cook something a bit more complicated. Friend W is coming to supper with them (they are the friends we often meet in Kirby Lonsdale). We shall of course all go out together for a meal too - ! Our habit (four of us) of having a permanent booking at the local golf club restaurant for Sunday lunch means my morning is totally free. And what a morning it is - a Summer's day. Up with the lark so that I could walk Tess before it was too hot for her. As I write this she is laid flat out on the patio outside the window in the full sun. After a while she will get up, walk the width of the patio to the shade of the bungalow and throw herself down to cool off. After five minutes repeat. How have I spent the morning. I watered all the pots in the front of the bungalow (faces due South so they soon dry out) completed digging up the bulbs - just the tulips were left and they came up easily. I shall watch the long range forecast on BBC Country File this evening before deciding whether to plant my geraniums or leave for a good rain. Yes, I know I can give the plot a good water but it isn't the same. Now, at 10.38 by my computer, I shall do the bit of ironing that is staring me in the face and then I shall have a leisurely shower and dress for lunch ready to collect friend W at lunch time. Salmon I think today. Lovely day here again today. I took myself down to the Garden Centre early this morning to buy some compost. I also bought two box trees for either side of my front door. They look very smart. I returned home, put on a load of washing and then made my morning coffee and watched a bit of the build-up to the wedding. I found it a bit boring after ten minutes or so, so I went out into the garden and lifted the bulbs in a plot where I intend to put purple geraniums. Someone asked why lift the bulbs when they will come again next year. The reason for lifting them is to put them in a tub of compost and let the foliage die down naturally so that the goodness goes back into the bulb. I watched the actual ceremony (I thought the dress was beautiful and I also liked the simplicity of the flowers and the lovely children who were bridesmaids and page boys). I was touched by the bride's mother, who had a job throughout the service to keep her tears at bay (so did I). After that I did a bit more gardening and also separated three houseplants into individual pots (they were part of an arrangement bought for my birthday back in October). Now I have to find somewhere indoors to put them! Tess has just had her evening walk, a friend called in for half an hour with her grandchildren, I shall finish reading my side bar and then maybe have an early night. Sleep well everyone. I bought antirrhinums and geraniums (violet coloured flowers - should be interesting). Now tomorrow morning I shall empty the two beds I can reach of their Spring bulbs, which have almost finished, and put in the new plants. I can reach these two beds easily, so I shall enjoy doing them. So far all I have done is to put the new plants up against the wall of the bungalow and water them well. Friend W and I had our normal Friday lunch out today at our local Auction House restaurant. As usual it was delicious. My starter of Chicken liver parfait with toast and house chutney was so good - I really would almost have liked to have it again instead of my main course - lamb on a bed of baby broad beans and new potatoes, although that too was delicious. We had a look round the items in tomorrow's Auction Sale. I always find it rather sad - most of the items are from good house clearances and are things which I presume the owners in the past have treasured. There were half a dozen samplers - worked by children maybe between the ages of around eight and teenage years. All the love and work that goes into them and now they are passing into the hands of people who have never known the family at all. Perhaps this is a good time to say that a very dear friend, who passed away some years ago, embroidered a sampler for the farmer and I. I treasure it greatly and look at it every single day. The friend was the mother of my God-daughter, so if A is looking at this now I do hope it reminds her of the happy times we all had in the past when her parents were still with us. Well, the countdown to tomorrow's bit event is on. And Prince Charles will be walking the Bride down the last bit of the chapel to the High Altar. I like Prince Charles. I think his heart is in the right place. After a strict upbringing at a school he didn't like, I think he has done his very best to lighten things up to the best of his ability. And the way his two sons behave and the way they show their real affection for him is surely testament of how hard he has tried. So, gardening, eating lunch, watch that wedding now and again to see how things are going and keeping my trouser legs rolled up to let the air get to those wounds - that is the order of the day here in my little abode. Enjoy your day too. Today has been a hard day. This morning was the AGM of our local U3A. Our ukulele group were playing to start the proceedings so had to be there just after nine thirty. I got back home at mid-day and had to be out again at 1-15pm. I had taken Tess for a walk early in the morning and, luckily, it is a Pet Pals day so Jean took her at lunch time. All afternoon friend W and I have been playing ukuleles for the local Alzheimer's and Dementia Group. Sufferers and their carers come along and we hand out song books holding a collection of the songs they used to sing when they were young - and they sing along as we play and sing. It is a joy to see how well they sing and to see just how much they 'perk up' during the hour and a half. Now I am home again - and tired. Tonight I am due to have a Chinese with my son and his wife - so I think I shall put my feet up for half an hour. Are you intending to watch the Royal Wedding on Saturday or not? I would be interested to know. Walking round with Tess this morning I had on my thermal vest, jumper and fleece and was still chilly. I met a man in shorts and a short-sleeved shirt (!) and when I remarked that he must be hardy he said he was rushing to get home before he froze to death. Later in town I met friend W and we nipped into our local cafe for a quick cafetiere to thaw out before I went for my weekly hair do. Yes, it is our usual contrary May weather - every day a surprise, pleasant or otherwise. With that all important wedding coming up at the week-end I got to thinking about how weddings have changed for the likes of you and me. We can only ignore the cost of the forthcoming wedding on Saturday - that is a different thing altogether. But I look back on my first marriage in 1952 - a long and happy marriage of thirty nine years- and I think of the lack of money (it wasn't long after the war and some things were still rationed) - a real make do and mend affair, paid for entirely by my parents, who didn#t have a lot of spare cash. I played the organ in the Methodist Chapel in the village in Lincolnshire where we lived. The Minister therefore conducted the ceremony without a fee - and the organist played because he was a friend. I borrowed a white dress (and yes, I was a virgin) from my sister's friend who had married a few weeks earlier, bought a veil and head dress and carried a bouquet of white carnations and blue iris. My two little nieces were bridesmaids in dresses made by a lady in the village. They carried posies of anemones from my father's garden, each posy wrapped round with a silver doyley. My mother and my Aunt Kate did the catering in the Methodist Hall next to the chapel. We had our own pig so there was plenty of home cured ham and plenty of salad from the garden. The lady who lived opposite made the wedding cake. We spent the first night of our honeymoon in a hotel in Sheffield (the first time I had ever stayed in a hotel) - quite daunting for a nineteen year old, as I was at the time (my new husband was twenty seven and had been abroad as a prisoner of war, so was much more sophisticated). Then we spent a few days at my Aunt's house in Yorkshire. And that was it - and it was all bliss. My second marriage in 1993 to the farmer was in the village where the farm was. I paid for the wedding myself. I spent more on the dress than I have ever spent on a dress - just because I liked it. My Grand daughter (aged 7) was bridesmaid and we both carried posies of yellow roses. who is a professional cake baker, made our cake for us. There was no honeymoon - there were cows to milk. That wedding too was bliss. I have just been very lucky to have had two such happy marriages. Let's hope the Royal couple's turns out well too. Yes - sadly my garden has one section governed by Marestail - and I use the word 'governed' advisedly. Last week my gardener was rather pleased with himself when he said he had removed every piece. I went into the garden this morning and removed at least a hundred 'tails' which had appeared since then - and that is just in the bit I can manage to weed. It is actually a rather pretty weed (I believe one of the professional gardeners on the radio called it a 'prehistoric weed, impossible to eradicate'), so I am learning to live with it and embrace it. I keep telling myself that it is no worse than ground elder or couch grass - but not sure I believe it. It is possible to clear the area and get a licensed gardener to spray the spot with glyphosphate (you need a licence to use it) but it comes back again the next year - it is indestructible. Other than that my garden is coming along nicely. My gardener planted half a dozen evergreen shrubs for me last week and a friend left a bucket load of bits from her garden yesterday. At present they are sitting in the shade, waiting for my gardener to call. Most need to go in at the top of the plot, where I dare not venture: I am not sure-footed enough. Beautiful wall to wall sunshine here today and warm with it. Washing dry on the line outside - next job is to iron it. (Yes I am one of those ancients who still knows how to wield an iron). Young Musician of the Year. I have been watching the Young musician of the Year final on the television this evening. The standard of music from the three finalists, each one playing with the City of Birmingham Symphony Orchestra, was staggering and I personally found the performance of Lauren, the pianist, who played Prokofiev, quite overwhelming. At sixteen she was able to put such an adult interpretation on to what is recognised as one of the most difficult pieces to play and I was so pleased when she won. I don't think there was a dry eye in the house - there certainly wasn't in this one. Be strong my dear - for his sake and the sake of your children and grandchildren. My heart goes out to you on this very sad day. I send you my love - I shall remember Col from the short time we spent together over coffee three years ago. Today is the Thursday in the month when we play ukuleles at the retirement home in the village of Bainbridge in Wensleydale. The residents gather in their lounge and we play tunes at their request and we all sing. Everyone seems to enjoy it and it passes a lovely afternoon. Going up the dale again after yesterday was yet another joy. The 'candles' on the horse chestnut trees are in full bloom, the leaves on the other trees are almost all out and are still in pristine condition. They are a joy to behold. Back (fingers crossed) to a corrected television as the engineer came this morning and fitted a new piece to my aerial. Time will tell. Now a question for you. Watching programmes like Breakfast, where folk are interviewed, something struck me this morning. The language seems to be changing. Previously ordinary folk like you and me seemed to start almost every sentence with the word 'well'. Suddenly I noticed that this is changing. This morning people seemed to start every sentence with the word 'so'. Has anyone else noticed this - is it a trend or what? It is easy to criticise but I suspect that if most of us were suddenly thrown into the limelight over some issue we might forget syntax, grammar and the like and just try to struggle through what we wanted to say. But you might all watch out for a day or two and then let me know if I am imagining it. It might also be interesting to know whether there is a commonly used expression, or word even, which irritates you in the English language and which is in common usage. blowing - thermals have been looked out again. How about you? Well a lunch out - the next best thing. Over to Sedbegh in Cumbria, on the edge of the Lake District, to meet my God-daughter for a lovely lunch. A Yorkshire Platter which, believe me, leaves absolutely no room for a crumb of anything else. A board holding a very large, home made sausage roll, three slices of home cured ham, a wedge of Harrogate Blue cheese, brown wholemeal bread, butter, piccalilli, salad and cole slaw - I shall eat no more today. Beautiful scenery, lovely lunch, good company - what more could anyone wish for. And I defy any one to find a more beautiful drive than that over the Pennines from here to the Howgill Fells. Rain is promised for 5pm or thereabouts. That falling on my garden will make my day complete. Following on from yesterday's post I have decided to ask my handyman to paint my handrail with dark green cuprinol. I think it will blend in with the garden so much better. My son came round last evening and watered some of the new plants for me and climbing up the steps to the top of the garden was so much easier with the rail,and I felt much safer. The temperature has been falling steadily all day today and now, at tea time, it is quite cool and there has just been a sharp shower. It did strike me that even a short, sharp shower does more good than all my watering with the can. Something to do with the atmosphere and the way the plants soak up the moisture I think. More honey bees to rescue today . I wonder if there are hives nearby. The area around my bungalow has literally thousands of dandelions - perhaps they are attracting the bees. The dandelions are just beginning to throw out their seeds so there will be just as many if not more next year. They are such a lovely colour, what a pity they are judged as weeds. It is nice to see the swallows back. No swifts yet but after this warm week end they should soon be around. But to see the swallows gliding around in the thermals is a start - Summer is just around the corner. You will see that my main handrail is almost finished - you will also see from the steepness of the steps that I really do need it. .In the hour since I first wrote today's post I have had to 'rescue' (using the glass and postcard method) eight honey bees from my kitchen and sitting room windows. They seem to have a bit of a death wish today. The warmest Bank Holiday since the 1970's - absolutely lovely here - not too hot but wall-to-wall sunshine. As I pottered in my garden (the most I can manage) I couldn't help but notice the number of bees (not honey bees) who seemed to be looking for a 'home' in my stone wall. Perhaps somebody can throw light on what they are doing. It was the day when the Tour de Yorkshire came through our little town and also through the village where my son and his wife live. It started in Catterick Garrison, about ten miles from here, and finished in Scarborough something like 170kms later. I watched a lot of it on Channel 24 (it will be on there again tomorrow). Although it actually came across the end of my road I can't stand for long enough to wait for its arrival. But, by golly, the end was very exciting. I have planted a few more plants today - a Berberis, an Iberis, a Pyrethrum and an Artemesia. So when my garden calls he will just have the evergreen shrubs to plant for me plus a couple of rock plants. My handyman called to check that the cement was drying well in the handrails he has put up (it was) so all in all a successful day. And to complete it a lovely long e mail from my Grandson who works in China - a surprise and a very pleasant one too. Today a local Handyman is constructing me a handrail - well two actually - to get to the top of my garden. I just do not feel safe climbing steps without one. A dozen or so plants sit waiting for my gardener to come and put them in - and I expect that once they are in the garden will swallow them up and I still will have lots of space. I shall of course resort to John's advice to put pansies here and there to fill up. (I have already got a dozen or so in - and very colourful they are too). If you have time do look again at an update on the farmer's niece's post (Kitchy and Co) on my sidebar. 'A' really is such a talented photographer and constructs such wonderful images with her clever photography. This weekend sees the Tour de Yorkshire come through our little town tomorrow and for this event everything stops. Already the town centre is completely closed as flags, bunting, balloons, stalls, a stage, a big screen - everything - is put up ready for the arrival of the cyclists at around mid-day. As my son (who is a fanatical cyclist) says - there will be a long procession of cars carrying spare parts for the bikes - they will come first. Then the competitors will flash by at such speed that they will be gone in a second. Soon cars of spectators will follow and the town will become itself again. I suspect that the grocers/supermarkets might just as well stay closed because the road will be closed for much of the morning so nobody can get in to park and shop. The cafes should do well though as spectators rustle up hunger waiting for the bikes to arrive. The cyclists actually come past the end of my road but as I really can't stand for a long period of time, I think I shall give it a miss and watch it on television instead (I have been told it is on Channel 24). Still, it is a super event so good luck to all the cyclists. Starting with an absolutely empty garden, but with a structure in place, is quite a daunting prospect. This is not helped by the fact that I can only do a limited amount of gardening myself (if I bend over too far to put ina plant I tend to fall over head first). I do have a super gardener and we get on well and agree on all things green. It wasn't until I began a planting scheme that I realised just how big the garden is. It really looked quite compact but as I get another twelve rock plants and D puts them in it is hard to see where he has been. So after discussion we have decided to plant up the top section of what was to be a rockery with shrubs and to this end I have been today and bought seven evergreen dwarfish shrubs, some conical, some round, one which lies flat to the ground, and I hope these will form some kind of structure to add flowering shrubs here and there. Time will tell. At the moment all I can say is that my garden is eating plants and there is little to show for it. I did buy another six rock plants too but that was because I just couldn't resist them. I was reading over my breakfast this morning as my television has yet again gone off station (the TV man is coming later today to hopefully fix it). I read Virginia Woolf's 'The Docks of London' from her little book 'the London scene'. Shortish, very much to the point, without a spare word (as is most of her writing) and so full of description. It is a beautiful essay. And it did strike me about comparison with a painting of the London Docks and how much more I would learn from the essay and what a picture I could paint in my imagination from her words. Here's an example. She is walking along the docks, watching the men unload 'working with the utmost organisation'. One stops to speak to her and tells her some of the things they have found in sacks of cinnamon - a snake, a scorpion, a piece of amber, a diseased elephant's tooth. And so the essay goes on in the same vein. By the end we have built up an incredible picture of the life on the docks - the men who work there, the ships that come in and out each day - far more than we could ever do from a painting. So I ask you - which would you prefer - a painting of the docks on your wall so that you could look at it, imagine the life there, speculate on what is going on. Or an essay spelling out in detail for your imagination to work on. Can you compare? Obviously there is room for both. Perhaps it is just a case of personal preference. The first present the farmer ever bought me (long before we married) was a pretty bracelet. Not particularly valuable but I value it greatly now of course and wear it all the time. Yesterday morning I went to Book Group and definitely noticed my bracelet during the morning. At around six o'clock last evening I suddenly noticed that it had gone from my wrist. Horror - had I lost it? This morning I retraced my steps, calling in to places I had been yesterday and asking if anyone had found it. At lunch time I typed a letter to drop in at the Police Station telling them to let me know if any kind and honest person handed it in there. I was sad. I came home after lunch out with friends, came in and collected Tess to walk round the estate. As I locked my door I saw my bracelet. It was lying on my front drive. Luckily I had not driven over it. I had missed it when I went out this morning - it must have laid there since yesterday.